I’ve received a number of emails from people who are interested in joining my next intake for Blog Mastermind 2.0, but are worried that their topic won’t make money. Yaro, I’d like to take your course. Do you think my topic XXXX will work? I don’t know if I can make money with this subject? What do you think? There’s no point starting a blog about a topic that won’t make money (unless you just want to blog for the sake of blogging and not as a business), so it’s a question worth asking. How Can You Be Sure Your Topic Can Make Money? Over the years I’ve constantly evolved my advice to new bloggers regarding how to choose a profitable topic. The changes are a reflection of my own experience helping people and the current landscape we face online. Today the big difference is most markets that can make money online already have people making money in them. Yes this means the competition is already there, but it also means we don’t have to guess whether money is being spent. When money is being spent, you just need to figure out how to place yourself in front of that money with a superior offer. You can usually find this out by simply heading to Amazon.com to see what is for sale. Google can also help, as can searching for existing blogs, e-commerce stores, or popular social media channels or groups (since people often talk about products they buy on social media). 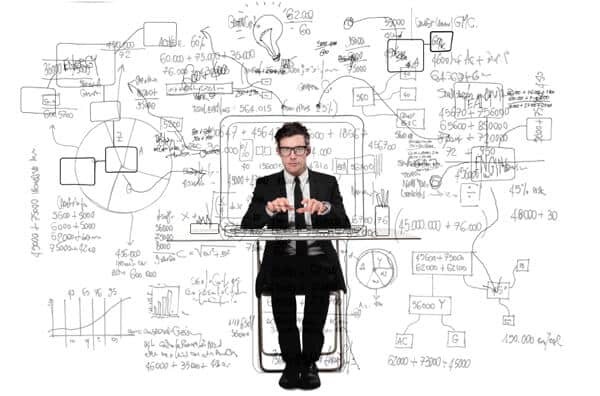 My secret tip for the research phase is to imagine you are your potential customer. How would they go about finding the product they need? Think like a customer and you can learn a lot. Once you determine there is money being spent, then you need to decide how you fit in. It’s vital that your strategy does not attempt to just replicate what is already on offer. You need to find your point of differentiation, your advantage – some kind of strength that gives you an edge. I recommend you turn inwards and assess any existing strengths or advantages you have. This may be a skill, or talent, or qualification you possess, or it could be an experience you had that lead to a unique insight. Powerful stories help, as does access to technology that others do not have, or even a certain relationship or contact can be an advantage. For most of my previous graduates, their strength comes from experience – from overcoming something in their own lives. When you have solved a problem or achieved something or gone through an experience that others want to replicate, then you have a unique strength. Once you know there is money being spent in a market, and you have a strength you can tap into, the rest of the process becomes systematic. Your job is to run a lean test using a minimal viable blog sales funnel experiment. By that I mean you make an offer to solve that problem using a product format you can deliver quickly, for example phone coaching or freelance work or a small/simple version of your product. The purpose of this experience is straightforward – get yourself your first buyers. Nothing matters more than getting buyers if you really want to know if your topic is profitable. If you can get yourself 5 to 10 customers from a basic offer, that usually means you have the potential for a business if you scale up the numbers (more traffic, more product and thus more customers). As much as I can help as a coach, no person can answer the question for you of whether your topic is profitable or not. Only your market can tell you that. The key is to focus on the problems people have and how they spend money to solve them. Never guess and never assume anything about your market just because you think or feel something. You only know for certain when you make an offer. I knew as part of Blog Mastermind 2.0 I’d have to provide something that addresses the issue of how to find profitable topics. By far the biggest challenge new bloggers face is the topic selection issue. 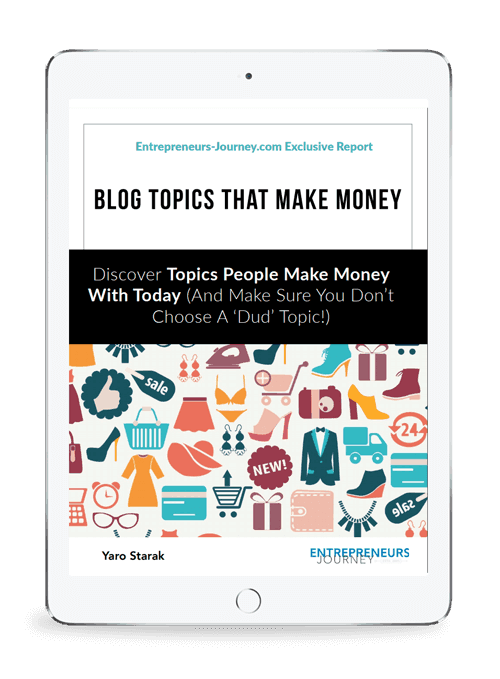 How can you start your blog with a proven profitable topic, to increase your chances of making money? This is the puzzle I sat down to solve when I began creating a special pre-training program for the new version of Blog Mastermind. 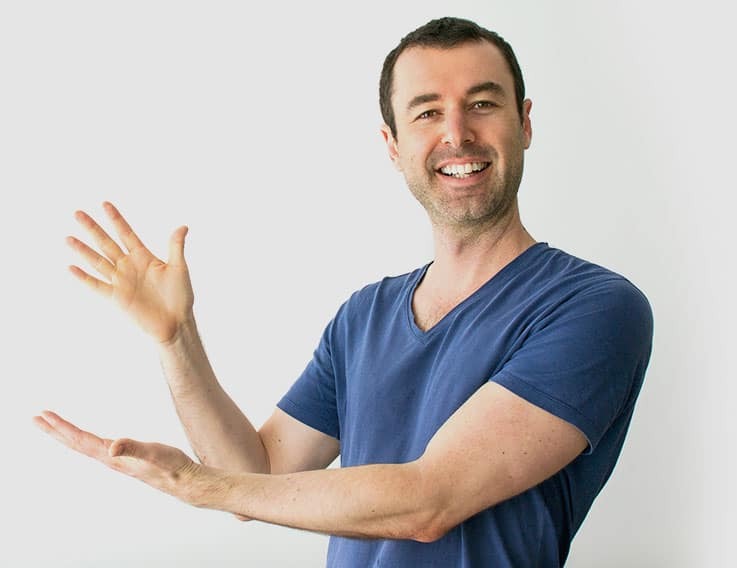 After mapping out an entire mini-course, I got busy recording it into a special one and a half hour program, plus checklist, tasksheet and additional 20-minute implementation training video, all focused on helping you get as close to a guarantee of picking a money making topic as possible. I call the program the “Blog Money Finder”. This is a training course that really goes deep into finding a profitable topic perfect for you. There’s a lot of strategy involved in this decision, plus plenty of self reflection and of course, some research too. To really understand the emotional needs of the people in a market and how your unique personal strength fits in takes a level of insight that most people never bother to go “deep” into. The Blog Money Finder will help you gain the depth of understanding you need to truly see where you fit in and who you are best built to help. It’s the perfect first step before beginning Blog Mastermind 2.0. Did I mention it’s a FREE bonus? 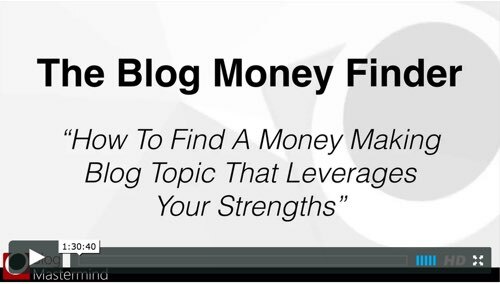 That’s right, you receive the entire Blog Money Finder program as part of your registration for Blog Mastermind 2.0. If topic selection is your challenge, if you’ve never made money online before because you went after the wrong market, this is the training you need. I think every blogger should go through this training, even if you are already successful. No one knows enough about their market especially when it comes to emotional decision making. To begin the Blog Money Finder program all you have to is sign up for my Blog Mastermind 2.0 class. The Blog Money Finder program is available immediately once you login to my membership area as part of your “pre-training” before you stat the core Blog Mastermind workshops. I know you will love the program and I can’t wait to learn more about your project. Yaro you lost me at “There’s no point starting a blog about a topic that won’t make money”. I can’t stress the following enough; A blog is not a business. I’ll repeat this again for emphasis. A business is a business. A blog can be a component of a business. There are some reasons to start a blog that won’t make money. Blogging is simply another term for writing and today you can make money from writing just about anything, just as you could hundreds of years ago before the invention of the printing press and the internet. You could start a blog because you want to gain notoriety and sign a book deal or become a columnist with a publisher. You could start a blog to gain a reputation and become a public speaker. A blog can be a marketing tool to generate sales for your business. In your case a blog is mainly a marketing and lead generation tool for your training and coaching business. In my view a blog is a perfect test vehicle to see if there is profit potential in a market. The biggest expense in testing the market via a blog is your time and behind every successful entrepreneur or businessman there usually are multiple failures. I agree with you Dan, but I think we might get caught up in semantics if we discuss what parts of a business constitute a business, which is really not the point of this article. Let’s just keep it simple – if you want to create a blog that allows you to derive a profit from it in some way (whether that is a “business” or just a component of the overall business) then you need to assess whether there is money being spent in your market, which is what this article is about. That is what matters to people. Thanks Dan for mentioning this. It’s an issue that has been confusing me. I see what you’re saying. It’s an important distinction. With that in mind, when I read Yaro I’ll keep in mind that he could be suggesting that the topic that you cover should have some components to it that others want to buy and with your suggestion I see that the “blogging” is a component of outreach and public relations. Wow. This clears up a lot of things for me. And that is definitely what matters to people. I think you will find the answer in this post Niaz… Let me know what you think it is? I guess, when there is a hungry audience on your niche, it’s a plus point. I think I have to come up with great contents that should be marketed in a proper and unique marketing framework. It won’t be hard, that’s all I want to think of right now. Excellent piece of advice as usual. This HAS to be the first and foremost step of a project. Instead of following the shiny objects, one has to make the decisions based on rationale and logic. If the topic / niche / idea is not profitable, there’s no point going towards it. Yaro your message is right on and I know you are speaking from your personal experience. It is so important to test an idea/ opportunity before spending months to find out there is no market for it. Building out a product, planning a product launch, and marketing funnels take long hours with minimal if any income. I believe the slogan is Fail Forward Fast! Thanks for your continued presence. Hmmm – I admire your restraint Yaro when replying to ‘Dan’ and his comments. I, on the other hand, have no need to restrain my reply to ‘Dan’. You miss Yaro’s point entirely. And playing the semantics game IS a total time waster for all concerned — most especially your own time ‘Dan’. Did you actually read all of this post — word for word? Great questions and answers Sir Yaro.. Love the explanation as well. I am new in blogging and I really want to improve My skills in writing articles, I’m always thinking what topic should I write that people may like it and I read this article really helpful for me. Thanks for the best advice. Thanks for publishing this premium advice, I also have an Idea and now going to test the same following your words. Yes, one should answer those questions to know about his blog topic is profitable or not. Thanks for the great article. Great post Yaro. I’ve always enjoyed how you can explain difficult topics in such a simple and succinct manor. This in my view is definetely one of your strengths/points of difference. I remember years ago learning topic selection from you and back then the landscape was different. There were still many niches that hadn’t been tested. It’s something I hadn’t thought of in a while but you’re right. In today’s landscape you just need to pick a topic where people are spending money and work out how you can use your unique strengths/experience to provide a uniqie offer. From someone who has learned first hand from Yaro I highly reccomend blog mastermind if you want to grow your online business. I use to go back and forth with this. I started in network marketing and now I’m doing more affiliate marketing. The one thing I did to figure out what I wanted to blog about was look at my Google Analytics to see what posts were the most popular. With that said, I made my judgements and took action. There are a group of people I want to focus on because frankly I keep running into the same people LOL.. So this will tell you something of what topics you want to write about! The biggest problem for a new blogger after they got the topic for their micro niche is the keyword for optimation in SEO. I heard that some of them got stressed when they knew most of the keywords from related topic are in the medium or (maybe) high competition. High expectation to get more traffic and earning sometimes is challenge and made someone down. So, be a passion and resillience might be the answer. Am I right? I’ve had three profitable businesses and never did keyword research for any of them. Market research about what I talk about in this article is a lot more important than keywords in my opinion. I’ve only just started exploring your site and I find it very easy to understand and very motivating. I’m wondering if you have an affiliate program with a simple blueprint to follow so I could promote it on my fb page. I guess a profitable topic would be a topic that already has a related online market system, ready to be naturally plugged. Clothes on a fashion blog being the first thing that comes to my mind. Great information. People will spend the money on solutions to problems and depending on the niche that can be quite lucrative. It’s amazing how many blog posts that are out there talking about blog post ideas – such as “10 ideas you can use to write a blog post”. Where in reality you should write a blog post that solves a problem for your readers or helps them with an issue by offering a tutorial. If you have an idea of your market that should be pretty straight forward. Another method you can use to ensure a profitable blog is to build it around an affiliate program. Become an affiliate member of XYZ affiliate program and then build your blog around that program. You can teach new members that sign up how to navigate the back office, what tools are available and where they are located, share success stories, etc., etc,. Hello Sir, what are the improvements in Blog mastermind 2.0 over the 1.0 version. Is it worth upgrading?Have the original chapters been updated? I recommend you take some time reading over that page and listening to some of the case studies, there is a lot to learn from that alone! Interesting topic, and one that I’ve heard many different views on over the years. I remember reading a couple of articles in the past (not on your blog Yaro) that have offered highly complex research-based algorithms which literally take days to conduct. I think you have hit the nail on the head though mate – it’s not so much about a complex algorithm in order to identify a profitable niche – it’s about putting yourself in the customer’s shoes and providing them with something of value, something that they can’t find elsewhere.